It has taken many years and now it the heavy lifting is done. When in Washington, D.C. it is a must to tour this newest of museums on the Mall. Eso Won carries an assortment of titles on the building, layout and archives in this magnificent edifice. 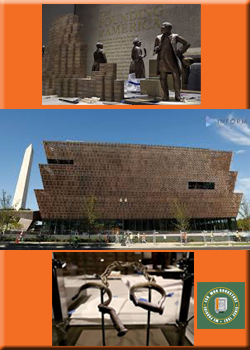 This souvenir book showcases some of the most influential and important treasures of the National Museum of African American History and Culture's collections. Dream A World Anew is the stunning gift book accompanying the opening of the Smithsonian National Museum of African American History and Culture. It combines informative narratives from leading scholars, curators, and authors with objects from the museum's collection to present a thorough exploration of African American history and culture. Rising on the National Mall next to the Washington Monument, the National Museum of African American History and Culture is a tiered bronze beacon inviting everyone to learn about the richness and diversity of the African American experience and how it helped shape this nation. Volume four in the Double Exposure series features a diverse selection of photographs of children: spontaneous records of intimate family moments, playtime, and communal activities, as well as posed portraits. Photographers include Henry Clay Anderson, Wayne F. Miller, Joe Schwartz, Jamel Shabazz, Milton Williams, and Ernest C. Withers.